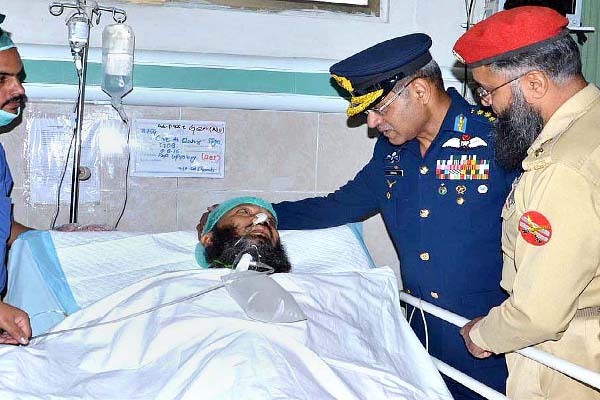 Chief of the Air Staff Pakistan Air Force visited Combined Military Hospital (CMH) here Thursday. He inquired about the health and well being of the injured who got wounded in the dastardly carried out bombings in Civil Hospital Quetta on 8th August and today’s roadside blast at Zarghon road. terrorists and prayed for their health and speedy recovery. showed solidarity with the bereaved families. He vehemently condemned the perpetrators of these barbaric acts and reiterated his resolve to wipe out the menace of terrorism from the country. transport fleet to airlift the seriously wounded people from Quetta to various parts of the country. aircraft has already been assigned the role of an Air Ambulance to transfer injured persons from Quetta to Karachi. have shifted 73 seriously injured from Quetta to various hospitals of Karachi.